Yes, it’s been forever since my last post. And I knew it would be. It’s been almost a month since I started the MS Nutrition program at the CUNY School of Public Health at Hunter College. After a year and a half of prereqs, 41 masters credits, two years of full time classes, 90 practicum hours, 1200 fieldwork hours, and a 4 hour long national exam, I will (hopefully) be legally qualified to tell people to put down that doughnut. (Kidding… but if you really want to know what a Registered Dietitian does, check it out). The irony of going to school for a health profession, if you’re working full time, is that you don’t have time to cook, exercise, or get a full night’s sleep. While I’d love to spend my days wandering through farmers markets and cooking four course meals, summer’s over and the stack of Biochem and Biostats reading wins. For one of my classes, we’re doing a project on a food corporation and my group picked Trader Joe’s. So last Saturday I headed down to the Court Street Trader Joe’s to find a manager to interview/harass and perhaps beg for free samples. After chatting with Manager Jason (thank you Jason) in his Hawaiian shirt, I figured I should pick up a few groceries since I never really shop there – a 15 minute bike ride is just “too far” these days. I grabbed a salad for lunch which turned out to be pretty awesome – baby spinach with curried chicken, red quinoa, mango, and coconut chili dressing. For the next night’s dinner, I was tempted by the crab cakes, but ended up going with Chimichurri Wild Pacific Salmon and a packet of Seasoned Brussels Sprouts. The preparation time for this dinner was about 30 seconds. Drop brussels onto a baking sheet, add olive oil, roast at 400 degrees for 30-40 minutes. When you pull them out, throw the pre-marinated salmon into the oven in place of the sprouts, and you have dinner 10 minutes later! I also added some of my favorite brown rice to the mix – Lundberg short grain. 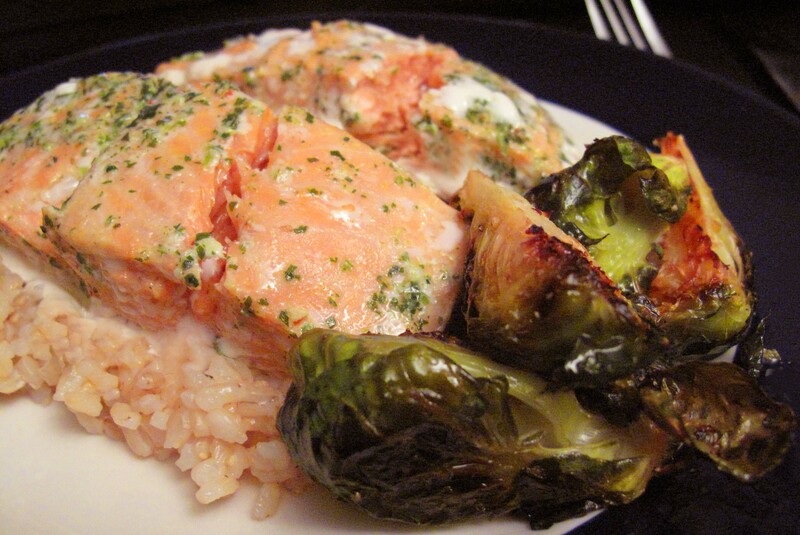 This entry was posted in Cooking adventures and tagged dinner, fish, quick, veggies. Bookmark the permalink. i discovered roasted brussels last year–omg. i thought i hated them all this time. have you tried kohlrabi? it’s this years find for me–amazing.